To say I was surprised by the Backstreet Boys movie would be an understatement. I watched this movie for the benefit of someone else but came out of it quite impressed with an interesting story about a small time boyband’s meteoric rise to success and then some of the issues that came with that. I was always aware of Backstreet Boys and I have a solid appreciation for pop music so I knew that if little else, there would be a few songs I would recognise. Luckily there is slightly more to this move than just string after string of solid pop songs. This is about the band forming, how they became famous and how that fame started to peter out and disappear. Luckily, this is an interesting story. To be funded by the millionaire Lou Pearlman and thrown together as a young, dancing and harmony group, there was little reason for them to be a success and it’s interesting to see how in their home country of America, they did falter and that it was down to Europe to launch the band properly. These kind of tidbits and nuggets of rare information keeps the movie interesting, especially interspersed with footage from early years and solid talking heads from the band themselves. This is where some of the honesty begins to emerge. To their credit, the five Backstreet Boys are very candid and honest about their careers, relationships, experiences and some of the altercations with each other and influential people along the way. From harrowing family stories to a bizarre tale about bunny homicide, there is a lot for both the die-hard and the fair-weather fan to appreciate. The documentary takes the format of a behind the scenes look at their twenty-year anniversary album, In a World Like This. We get some very insightful moments, like their recording process and how they make key decisions for this album, as well as reflecting on past records. We also get a clear look at some of the issues facing the group, most of all Brian Littrell’s voice issues, which become very apparent as he records and performs throughout the movie, leading to a very telling confrontation in one quite difficult to watch scene. As real and in-depth as the movie is though, there are moments that feel hidden from sight or skimmed over. Both A.J Mclean and Nick Carter seemed to battle addictions, with A.J definitely having gone to rehab. These are mentioned but never really discussed at any length. The same can be said for the years that Kevin Scott Richardson left the band and the group continued as a four. it’s mentioned but never more than that, feeling like some of the story that is being told is very selective and some of the more difficult, choice parts are being missed out. There is enough here to deliver a good story though and mix those tales, personal and as a group, with some of the biggest pop songs of the nineties and you’ll soon find yourself sucked into the story and what the film is delivering. You may even find yourself craving a greatest hits album. 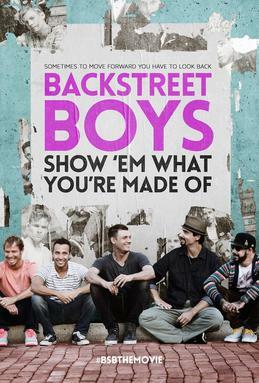 Overall, Backstreet Boys: Show Em What Your Made Of is a solid documentary retelling a decent story of a very famous boy band who are still trying to make it big. There is a lot of interesting elements and at times it feels like you are getting an uncut look at the lives of the five but then moments feels hidden and a huge part of the story, although hinted at, seems skimmed over and avoided. I guarantee you’ll be singing one of those decent pop songs you forgot you knew all the words to though. Previous Previous post: Why so Serious? – What has happened to light-hearted superhero movies?